Beijing-Part 2 | the best is yet to come. The second day in Beijing was my favorite. We started the day with a healthy hearty breakfast at the hotel. We were running a little behind schedule so Andrew went into the lobby to check if our tour guide, Hubert had arrived yet. Almost as soon as Andrew left he came back. He excitedly told us that Jokim Noah (NBA Chicago Bulls player) was in the lobby! So Landon and I jumped up to go see Jokim. I wanted to take his photo since I go to school in Chicago and figured a lot of my friends would think it is cool. As soon as we walked away from taking Jokim’s photo Andrew yelled to us, “Hey guys look it’s Yao Ming!” We whipped our heads around and witnessed Yao Ming (retired NBA player) walking over to Jokim from across the hotel lobby. Andrew was right there and immediately extended his arm for a handshake with Yao. It all happened so fast but as we walked back to our breakfast table Andrew was overcome with happiness and excitement that he got to shake Yao Ming’s hand. The start to our day was exciting and it only got better! We met Hubert in the lobby and he brought his 12-year-old daughter so she could practice her English. She was adorable and so sweet. She knows Chinese calligraphy, which many young people have no interest in anymore. Hubert told us that the night before she stayed up making each of us our own poster with a Chinese saying on it. Mine has something to do with good fortune. It is a lovely work of art. We started the tour with an authentic hutong rickshaw ride. For those who don’t know what a rickshaw ride is let me tell you. The rickshaw began as a 2-wheeled passenger cart, called a pulled rickshaw, and generally pulled by one man with one passenger. The rickshaw I rode in was a cycle rickshaw which is a cart pulled by a bicycle. Fun fact, Beijing used to be known as the bicycle kingdom. In 1989, there were more than 4 million bicycles on Beijing roads and 60% of the residents used bicycles. The rickshaw tour was really nice. We went through a hutong in Beijing. Hutongs are a type of narrow streets or alleys associated with Beijing. Traditional courtyard residences form hutongs. Joining one courtyard residence to another to form a hutong formed many neighborhoods. Since the mid-20th century, the number of Beijing hutongs has dropped dramatically as they are demolished to make way for new roads and buildings. More recently, some hutongs have been designated as protected areas in an attempt to preserve this aspect of Chinese cultural history. As we toured the village we saw many locals going about their daily agenda. Some people were doing chores and others were sitting outside people watching. During this time I felt more like a local that a tourist. I was slowly being immersed into the Chinese culture and I was enjoy every minute of it. One of our stops during our tour was a house with an elaborately decorated façade. The rickshaw driver explained to us that the wooden pegs over the houses we passed symbolized the wealth one possessed. The more pegs one had over their house and the more colorful and elaborate designs those pegs had, the more money one had. The particular house we stopped at had four pegs. After our rickshaw tour we went to the Drum Tower. It was another beautifully oriental building. Our tour guide wanted us before we made the climb to the top that the stairs were steep and boy he wasn’t kidding! It was a bit nerve wracking ascending the steps. All I could do was slowly take one step at a time and keep my head focused on my feet. I have climbed many steep mountainsides and tall buildings but the adrenaline never gets old. When we reached the top we overlooked Beijing. Unfortunately, it was smoggy and we couldn’t see very far. We did learn that the tower was originally built for musical reasons; it was later used to announce the time. The drum towers (as well as bell towers) was used by the government and common people as timepieces up until 1924, when the last emperor of the Qing Dynasty was forced to leave the Forbidden City and western-style clockwork was made the official means of time-keeping. It once held 24 drums but now only one survives. As the day went on I felt more and more immersed in the Chinese culture. The best part of the day for me was the Chinese tea ceremony. Before we ate lunch we partook in a traditional Chinese tea ceremony! 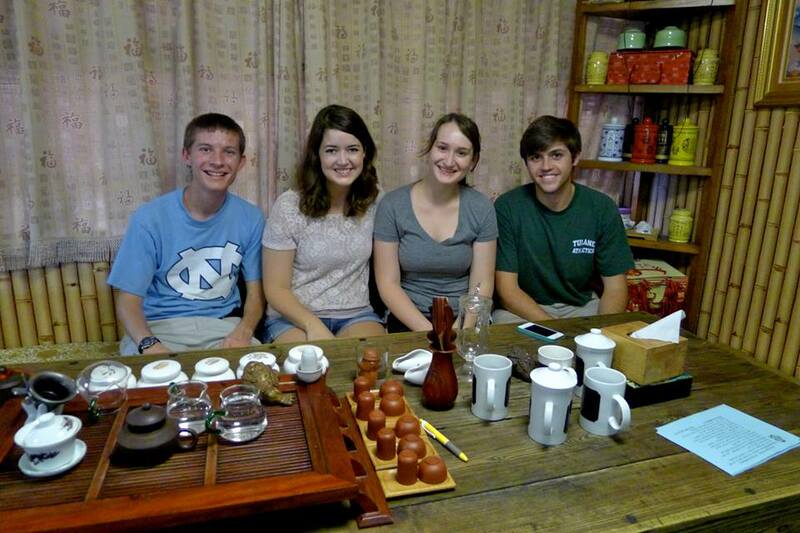 I learned so much about tea and how influential and important it is to China. The lady who ran the ceremony taught us all about the benefits of tea drinking and introduced us to several of the most popular teas in Beijing: Ginseng Oolong (I purchased some of this! It is nice and fresh not in a little bag and it is so good! ), Jasmine, Pu’er, Mixed Fruit, and Lychee with Rose. We learned how to properly hold a teacup (at least a Chinese tea cup which is different than the mugs and cups we are used to). The lady also told us that tea is therapeutic and after drinking it she told us to rub the tiny clay teacups on our faces to give us a nice massage. It was very soothing and I could imagine my mother being there with me soaking up all the knowledge she could about tea and its therapeutic benefits. (I am glad I bought some tea to share with her when I go home!) I also purchased a tea cup/maker thing. Pretty much it is a teacup, similar to a coffee mug, but it has a removable strainer so I can make fresh tea! As soon as I spotted it I knew I had to have it because it has a traditional blue design. I hope someday it will be a great conversation piece. I hope someday when I have grandchildren they will ask me where I got such a beautiful teacup just like me when I visited my Grandma Gromek’s house and saw her collection. I really want to have items in my house someday that stand out and that my children and grandchildren will cherish forever. 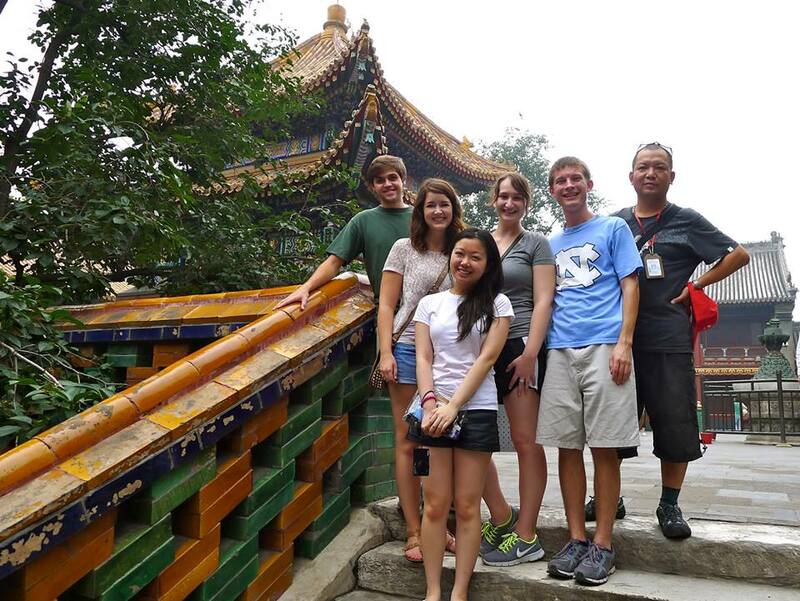 The last two stops on our tour were the Lama Temple (also called the Yonghe Temple) and the Temple of Confucius. Personally I enjoyed the Lama Temple more but that is probably because I could stop thinking about how much my boyfriend Matt would have loved it. He really enjoys studying and learning about Buddhism. He even has a tattoo of a Buddhist knot (also referred to as the endless knot) that is symbolic in Tibetan Buddhist art. It symbolizes the interweaving of the spiritual path and the flowing of time and movement. The Lama Temple is one of the largest and most important Tibetan Buddhist monasteries in the world. The Hall of Harmony and Peace is the main building of the temple. It houses three bronze statues of the Buddhas of the Three Ages, the statue of the Buddha of the Present is in the center, it is flanked by the statue Buddha of the Past, and the Buddha of the Future. While I watched people meditate in front of the Buddhas and I thought it was really a beautiful thing to witness. I really enjoy learning about other cultures spiritual and religious beliefs and practices. It is one of my favorite parts of a culture. At the end of the Lama Temple was the Pavilion of Ten Thousand Happinesses, which contains a 26-meter tall (18m above ground and 8m beneath) statue of the Maitreya Buddha carved from a single piece of white sandalwood! Across the street was the Temple of Confucius. It is the second largest Confucian Temple in China, after the one in Confucius’ hometown of Qufu. It occupies 20,000 square meters and includes four courtyards. The temple has many old trees, including one Cypruss tree known as the “Touch Evil Cypress” that has been made famous by folklore through the ages. 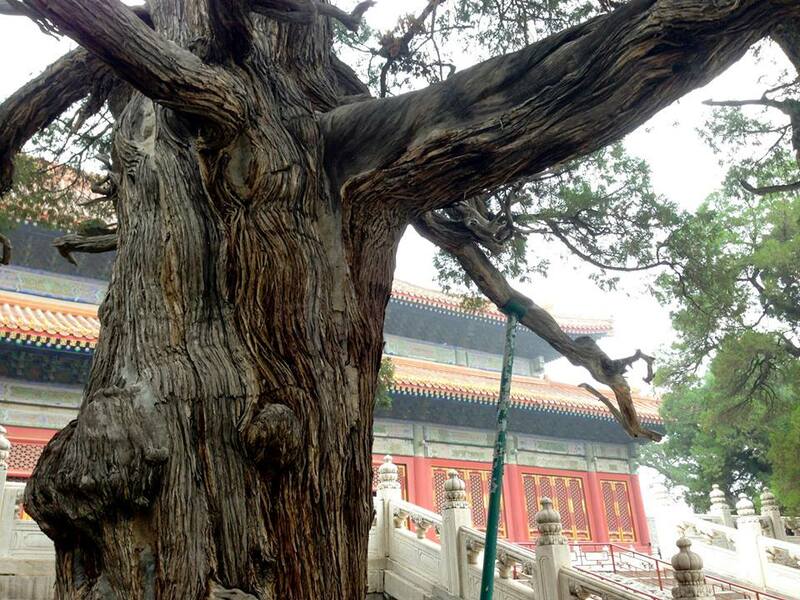 The tree is more than 700 years old!!! I wish my dad could have been there with me because he loves his trees! After our second day of touring Beijing came to a close we were all very hungry. Our tour guide offered to make us a reservation at a renowned restaurant as well as get us into a Kung Fu show later. We took him up on the evening festivities and went back to the hotel to shower up. Once we arrived at the restaurant later I was extremely hungry and excited to try the famous Peking duck! Everything was delicious! I really enjoyed the duck. The proper was to eat it (as shown by the chef) was to use our chopsticks to pick up some slices and dip it in a delicious sauce (it reminded me of P.F. Chang’s wraps in the U.S.). We put the meat and sauce onto a small wrap, added some veggie sticks, and then rolled it with our chopsticks. I have actually gotten really good at using chopsticks so it was fun to eat the duck. Not all of my friends had success with their chopsticks and decided to just eat it like a taco. After dinner we went to the local Kung Fu Show. It was amazing. Some elements reminded me of a Cirque de Soleil show I saw years back. The actors/Kung Fu artists were very skilled and graceful. It made me wish I knew Kung Fu! After the show, we went back to the hotel and got ready for bed. Looking back on the second day in Beijing it was by far my favorite. I loved being immersed in the culture!